Whether in the R&D lab or in production, the global navigation satellite system (GNSS) solution for the R&S®SMBV100A sets new standards in the field of satellite simulation. A number of standard tests are available for characterizing the performance of a GNSS receiver, e.g. time to first fix (TTFF) and location accuracy. Test runs often include an entire series of tests, each with a different scenario. Whether in the R&D lab or in production, the global navigation satellite system (GNSS) solution for the R&S®SMBV100A sets new standards in the field of satellite simulation. It supports all possible scenarios, from simple setups with static satellites all the way to flexible scenarios generated in realtime with up to 24 dynamic GPS, Glonass, Galileo, BeiDou and QZSS/SBAS satellites. 1)May be subject to export restrictions. 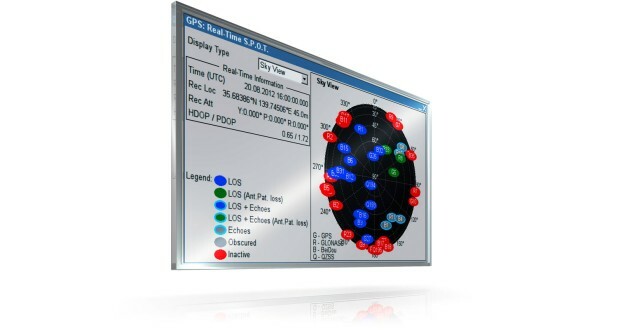 A number of standard tests are available for characterizing the performance of a GNSS receiver, e.g. time to first fix (TTFF) and location accuracy. Test runs often include an entire series of tests, each with a different scenario. Therefore, satellite simulators that allow users to simulate a wide variety of scenarios are ideal for this purpose. This is where the flexibility of the GNSS solution for the R&S®SMBV100A stands out: Only a few keystrokes are needed to generate complex scenarios, unlimited in time, with up to 24 satellites – including hybrid GPS, Glonass, Galileo and BeiDou constellations. Users can select the almanac file as well as the geographic position, and both stationary positions and moving scenarios that simulate the movement of receivers along any custom route are possible. 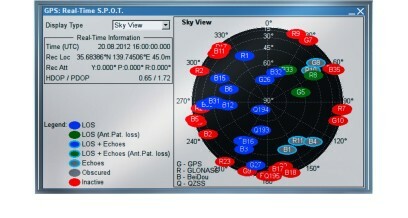 The signal strength of individual satellites can be controlled in realtime in order to simulate conditions of restricted satellite visibility. The GNSS functionality provided by the R&S®SMBV100A also includes the ability to simulate realistic transmission and signal reception conditions through the use of multipath signal generation, by modeling various atmospheric effects and surroundings with buildings and bridges, or by simulating realistic vehicle dynamics. The versatility of the R&S®SMBV100A is especially beneficial to mobile phone and car infotainment system manufacturers that integrate GNSS modules in their products, as it allows them to test a range of functions with a single instrument. This is possible because, in addition to GNSS signals, the R&S®SMBV100A also generates communications signals conforming to all conventional standards such as LTE, HSPA+ and WiMAX™ as well as signals for digital radio standards such as DAB, XM Radio or Sirius. These specifications in brief relate to the GNSS functionality of the R&S®SMBV100A. For specifications on the general performance of the R&S®SMBV100A or on the functionality of other digital standards, see the R&S®SMBV100A data sheet (PD 5214.1114.22) and the Digital Standards for Signal Generators data sheet (PD 5213.9434.22). 1) Depending on hardware option; may be subject to export restrictions.